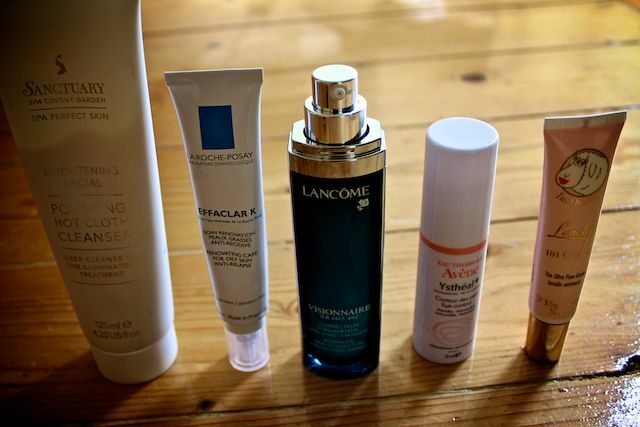 Nice collection, I really want to try the La Roche Posay Effaclar K and the Lanolips. I use a lot of decelor products- their cleansing milk, toner, rose oil, essential balm and moisturiser. I intend to deviate onto some other skincare brands but you know when something is just THAT good for your skin, its hard! I do use Origins Ginzing eyecream which is absolutely amazing, like a drink for the eyes! Although im assuming you've tried this as everyone seems to have! I'm loving my Lush Angels on Bare Skin at the moment but I think we've very different skin types - mine is naturally dry as hell. I'd love to try some of the Lauder Idealist serum but don't have the money to waste in case it's crap. haha, my BF last said to me: "you have a tube for _every_ part of your body.."
I used to use the LE but good luck finding that in rural Ireland! Think I'll stick with this formula as it has knocked the sensitivity on the head! @Laura - oops: actually I havent'! must try it if the Avene ends up being rubbish! @Lorraine - i remember trying that once and it left my skin very smooth. wouldn't mind giving it another whirl actually. @misspinkaholic - you know i have noooo idea! is the m mattifying? The K is more of a treatment for texture....I think. @Onyx - ooh i love Elizabeth Arden but it's just never something i seem to buy for whatever reason. I will stock up on Liz Earle when I am back in the UK in a few days. Will visit the shop near Sloane Square and then cheekily browse Kings Road as well. I bought the Sanctuary one at TK Maxx as the LE ran out and am not too pleased. Thanks for the Kiehls Acai Serum bash as I wasn't sure about buying this. My skincare does include religiously using the Clarisonic though and it worked wonders for me! Can't wait to hear what you think of Lancome Visionnaire after you've used it for a while! I've just really gotten into skin care products and since I lived in California before I was so sad I couldn't try the Liz Earle cleanse and polish. I live in England now though and have joined the believers! It took me ages to find it though! It would be soo good if it were available in Boots! I received a leaflet from Liz Earle in the post- they are putting their prices up from September so if anyone is looking to buy/try, best buy in August when it is will be (a little) cheaper. I love Avene products and didn't know they did an eye cream so I might check that out! Good old Carmex does the trick for me every time with my lips (and it'a as cheap as chips, bonus! ), however, I do want to try lanolips, Fleurdeforce loves the lemonaid one which sounds amazing so I'm going to pick that up! 3 days ago I bought effaclar k, still dont know what to think about it. I recently picked up minis of some of the Benefit skin care line. I heard good things about their eye cream, so I'm excited to try it. As I just tweeted you (Eleonore813), I warmly suggest you to try SkinCeuticals CE Ferulic and Hydrating B5 Gel (following with your moisturizer and a sunscreen, of course). These will help prepare your skin for autumn (and winter of course). They're a little bit pricey but they do wonders for skins (mine is better than before). hey i feel your annoyance about the whole liz earle distribution thanggg. however i'll just share my little secret, i found LOADS on ebay, genuine thingg and its mega cheap. Next time your running out deffo get a glance on there!!! @MissCatherine - thank you for the tip off! I have no idea how to pronounce that Avene eye cream either. I've used the The Sanctuary Cleanser too and wasn't overly gone on it to be honest. Their exfoliator on the hand is brilliant. I use the Effeclar K or Duo only as a treatment really - t-zone only - and a normal moisturiser or at the moment Effclar M(I think? )on rest of face. I prefer Duo as a primer than K - I use K as a night treatment. But if you only want to use one I find Duo is more moisturising! Other fantastic products from Avene include TriAcneal (put it on zits and they'll die presto) and Cleanance K but you have to tolerate AHA/BHA. I also like the LRP Redermic C eye cream. I'm very curious about that new Lancome product, I read it took them over 10 years to develop it! Can't wait to read your opinion! Hello sweetheart! How are you doing? I was missing a skincare blog post of yours so much! Let me say I am totally addicted to La Roche Posay products, in fact, it is the only one I have tried of the ones you show us today. I cannot tell how many "k"s I have used in the past, and I always tend to have a tube in winter. Nevertheless, I feel the need to let my skin rest after finishing the tube, because if not, my skin gets used to it and it becomes less effective. If you like this product, you may like the whole Effaclar range, the moisturizer H is so good! And the foam and gel are the best cleansers I have ever tried. I definitely recommend the Sibu Cleanse & Detox Facial Bar. I have clear skin but it cleaned up the pores on my nose (the one place I break out if I do) and it's really helping with the milia under my eyes that I'm really prone to. You should try it! Lancome Genifique is also a great moisturizer! I have yet to encounter this lancome visionnaire. Plus if you want an effective eye cream maybe you should try tri-aktiline by Good lab skin.. I've heard it works great as well. I"ve got the La Roche Posay Effeclar K and wasn't that impressed by it, Avene Triacneal work a lot better and is a similar product. Why do you have to use animal tested products? THere are sooo many good vegan options out there. Please at least try to look into it and take those things into consideration. Hi Laura - is La Roche Posay Effaclar K to mattifying? I have been considering this for a while but i dont want to be too dry/matte effect especially in summer? Hi Laura, love your new blog! I was wondering do you still use any of the Sarah Chapman Skinesis products? And would you recommend them for dry/sensitive/acne prone skin?... Thank you! bahahha the more sh*t you need to hold it together cracked me up. it's impossible getting that liz earle cleanser!! About the Ysteal and exe creams. I really like watching kathyspears on Youtube and she talk about retinaldehyd: http://www.youtube.com/watch?v=oreX87AAWz8 and there is another video about eye creams and that its a waste of money etc. Its worth watching!!! I have the Ysteal face emulsion and use ist for my face and under eye area. I'm so glad I'm not the only one who thought the Kiehl's Acai serum was a dud! I have been applying it in bulk (just to get rid of it) and still no results! Although I also bought the Kiehl's anti-ageing eyecream and I really like that! Natural skin care products such as cream protects your skin by leaving a natural organic wax layer on your skin while still enabling your skin to breathe and maintain its natural moisture. this organic skin care cream is a must-have product to use in the harsh hot, dry weather. stuffiest help to protect your skin but not permanently.collection of this stuffiest hot. activities for introducing about medical and show great powerpoint presentation Which help to increase your business. Slide World provides Medical PPT Templates Which can use Medical seminars, Meetings, Medical Conferences and Other activities for introducing about medical and show great powerpoint presentation Which help to increase your business. You have an interesting collection, Laura. But I need some advice for a beauty regimen. You see, I just had a diamond peel treatment. I don't usually purchase or use beauty products. Can you recommend me a product / products that I can use to maintain flawless skin? Great! good presentation made to present. Breathing PPT provides wholesome knowledge of important chain of life of fishes and how they take breath. Good PPT for presentation. Breathing PPTprovides wholesome knowledge of important chain of life of fishes and how they take breath. Wow! This is fantastic to choose research paper topics .with the help of this. These templates contains very valuable contents and will serve your purpose. I Like The Sanctuary Polishing Hot Cloth Cleanser.Thank you for sharing your blog information.